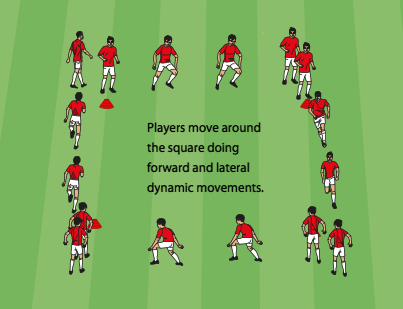 This is an easy dynamic warm-up variation for players to perform both forward and lateral movements. Set up a square grid and create even lines at each corner. For large teams this warm-up can be done with multiple squares. Players perform dynamic locomotions around the square. Two variations include doing one locomotion all the way around or having a different locomotion on each side.